Generation Z is rapidly replacing Millennials on college campuses. Those born from 1995 through 2010 have different motivations, learning styles, characteristics, skill sets, and social concerns than previous generations. Unlike Millennials, Generation Z students grew up in a recession and are under no illusions about their prospects for employment after college. While skeptical about the cost and value of higher education, they are also entrepreneurial, innovative, and independent learners concerned with effecting social change. Understanding Generation Z's mindset and goals is paramount to supporting, developing, and educating them through higher education. Generation Z Goes to College showcases findings from an in-depth study of over 1,100 Generation Z college students from 15 vastly different U.S. higher education institutions as well as additional studies from youth, market, and education research related to this generation. Authors Corey Seemiller and Meghan Grace provide interpretations, implications, and recommendations for program, process, and curriculum changes that will maximize the educational impact on Generation Z students. 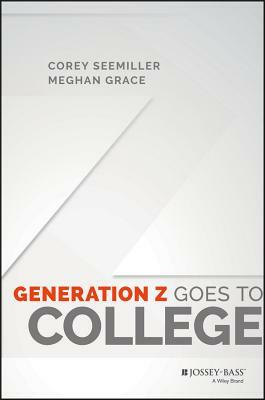 Generation Z Goes to College is the first book on how this up-and-coming generation will change higher education. COREY SEEMILLER is a faculty member in the department of Leadership Studies in Education and Organizations at Wright State University. She is the author of The Student Leadership Competencies Guidebook from Jossey-Bass. MEGHAN GRACE is the new member orientation director for Sigma Phi Epsilon fraternity.